C++ smart pointers rely on the ability to overload operator-> (and, less importantly, operator->*), whose invocation precedes any access to the pointee. Unfortunately, there is no such thing as overloading operator. (even though the possibility to do so has been considered by Bjarne Stroustrup and others), which would allow for the creation of "smart reference" classes. Lacking this ability, a wrapper class has to go through the painful and non-generic process of replicating the interface of the wrapped object. We present here an approach to class interface design, let's call it slot-based interfaces, that allows for easy wrapping without losing much expressivity with respect to traditional C++ interfaces. The techniques described are exercised by a program available for download (a fairly C++11-compliant compiler such as GCC 4.8 is needed). Much as shared_ptr<T> acts as regular T*, shared_ref<T> acts as a regular T& whose (slot-based) interface can be unencumberedly used. This even works with run-time polymorphism based on virtual overloads of operator(). So, slots give us for free the additional possibility to use them with global function syntax. In fact, we can take this behavior as the very definition of a slot. Definition. A basic slot is a functor S resolving each invocation of s(t,...) to an invocation of t(s,...), for any s of type S.
Those readers with a mathematical inclination will have detected a nice duality pattern going on here. On one hand, slot-based classes are functors whose overloads of operator() take slots as their first parameter, and on the other hand slots are functors whose first parameter is assumed to be a slot-based class type. By identifying class access with class invocation and reifying member function names into first-class functors, slot-based interfaces allow for a great deal of static composability and provide unified concepts blurring the distinction between classes and functions in ways that are of practical utility. The approach is not perfect: a non-standard syntax has to be resorted to, public inheritance needs special provisions and operators (as opposed to regular member functions, i.e. functions like operator=, operator!, etc.) are not covered. With these limitations in mind, slot-based interfaces can come handy in specialized applications or frameworks requiring interface decoration, smart references or similar constructs. As a continuation of our previous entry on the statistical properties of hash tables with duplicate elements, let's now analyze how duplicates affect lookup times. Let N be the number of elements in the table, B the number of buckets and F = N/B the associated load factor. We have already learnt that the size S of a bucket follows (for large N) a Poisson distribution PF(n) with mean F. Beginning with the non-duplicate case, what is the average number of elements checked when searching for a given key k? In such general terms, the question is underspecified because lookup times differ depending on whether k is actually present in the table or not. The analysis can be done, though, considering each case in isolation. Key is not present. This is easy to calculate: the number of elements checked is simply the average length of a bucket, which we know to be F.
B(n) := Pr(k is in a bucket of size n). where we have used the fact that the second moment of a Poisson distribution with mean F is F2 + F.
We are now ready to study the case where the hash table holds M groups of duplicate elements, each group with average size G.
Key is not present. There are no differences with respect to the non-duplicate case; an entire bucket, whose average size is again F, is traversed when looking up for the non-present key. exactly as in the non-duplicate case. How come we see no degradation despite elements being heavily concentrated in fewer buckets? The reason is that the distribution of groups in the table is governed by an equivalent load factor F' = F/G which is much (as much as G) less than F, and the probability that there are two of more groups of elements in the same bucket is in consequence greatly reduced. 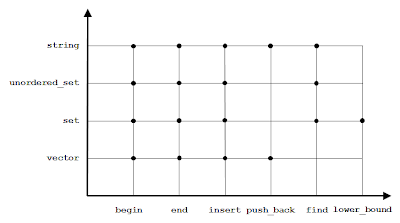 The hash table structures used by some implementations of C++ unordered associative containers such as Boost.Unordered allow for skipping of groups of equivalent elements. For these special hash tables, the average lookup steps are reduced to F/G, if the key is not present, and 1+F/2G, if it is. 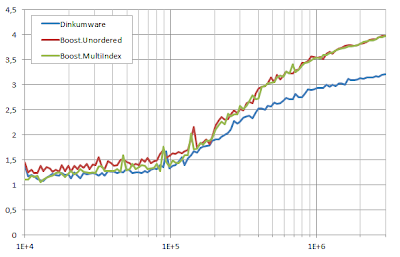 Dinkumware, as we have discussed in a previous entry, has the fastest hash→bucket mapping. 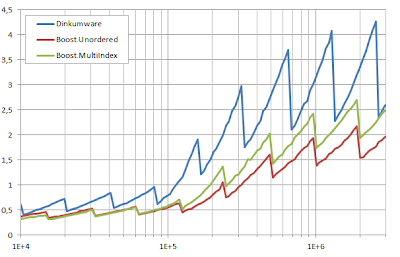 Boost.Unordered and Boost.MultiIndex use the same approach to locate the bucket to search through, namely mapping hash values to bucket entries with an expensive modulo calculation and getting to the bucket via the preceding element (thus worsening locality with respect to Dinkumware's procedure): Boost.Unordered calculates this modulo slightly less inefficiently and, in unsuccessful lookups, often has to do the calculation twice, the first time to locate the bucket, and the second one to determine when that bucket ends (if it is not empty). 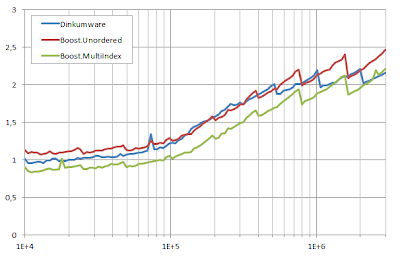 Now the disadvantage of Dinkumware is much more clear: with a typical load F = 0.75·Fmax =3.75, the average number of elements checked is 1+ F/2 = 2.875 for successful lookups and F = 3.75 for unsuccessful ones, while for Boost.Unordered the corresponding numbers are 1+ F/2G = 1.375 and F/G = 0.75, respectively, and slightly worse than these for Boost.MultiIndex as this library does not perform group skipping for group sizes ≤ 2.
where rnd_it_range(c) is a random shuffling of [c.begin(), ++c.begin(), ... , c.end()). I've written profiling programs for the non-duplicate and duplicate versions of the containers, respectively, which were built and run on the same environment as in previous entries. 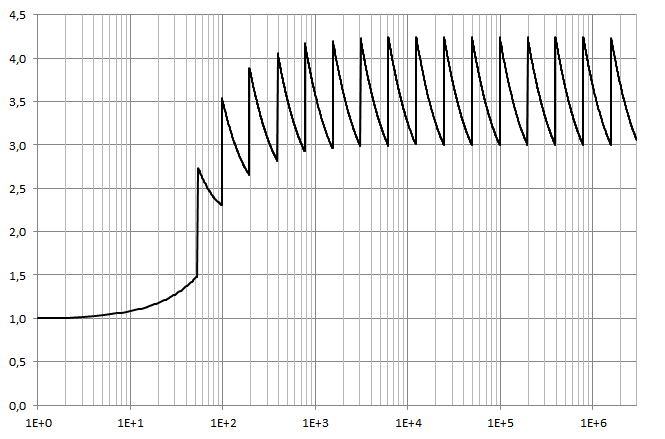 The graphics show resulting erasure times in microseconds/element for n = 10,000 to 3 million elements. 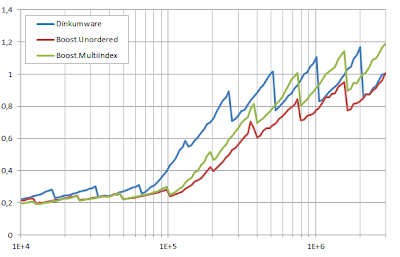 Dinkumware and Boost.MultiIndex have unconditional O(1) erasure since buckets need not be traversed to delete an element, and moreover the locality of their corresponding erasure procedures is very good: all of this shows as superior performance with respect to Boost.Unordered, which needs to do bucket traversal in order to locate the node preceding the one being deleted. 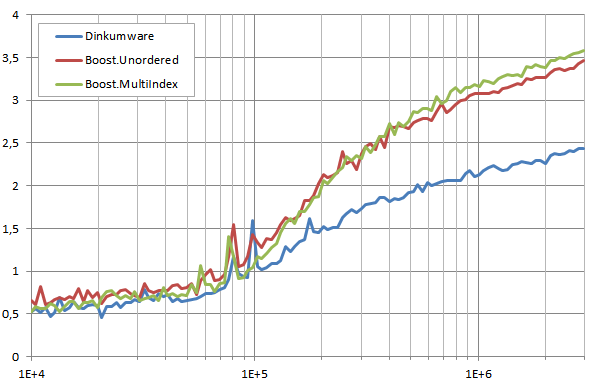 The CPU memory cache, which favors algorithm locality, makes the differences in performance increase when n is large. 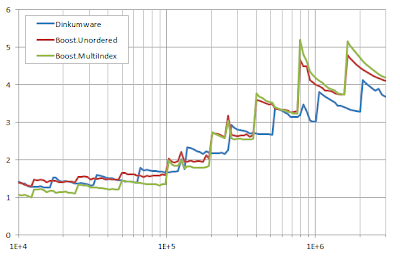 Dinkumware performance does not change, as this library's containers treat equivalent elements in exactly the same manner than in the non-duplicate case, and bucket occupancy, greater in this case, does not affect the erasure procedure. 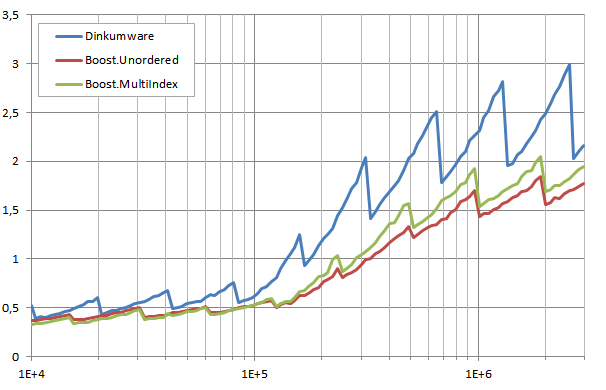 Boost.Unordered performance increases somewhat: when deleting a element in the middle of a group of equivalent values, the library does not need to traverse the bucket because the preceding and following elements are linked in a circular list; the net result is that locality improves for these elements and stays the same for elements at the beginning or the end of a group, thus overall performance is better. 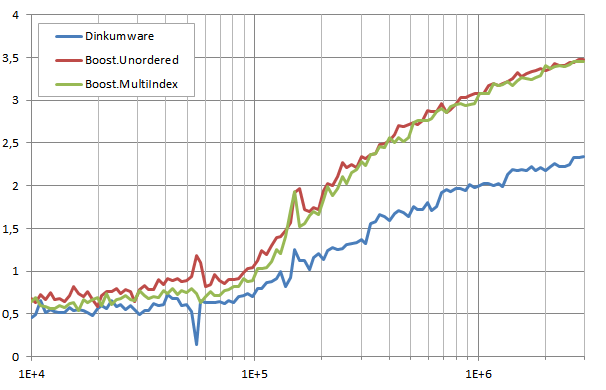 Boost.MultiIndex behaves the worst here: even though erasure is still unconditionally constant-time, the complexity of the underlying data structure implies that as many as seven memory locations can be visited to erase an element, 75% more than Dinkumware and at about the same level as Boost.Unordered. 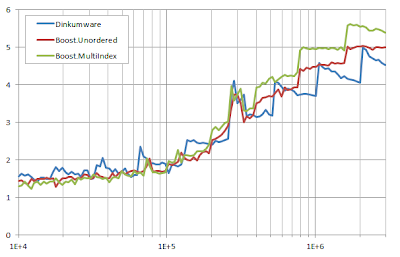 Boost.Unordered is the only library that could theoretically be impacted by the higher bucket occupancy, but the effect is nonetheless not noticeable. It should be noted that Dinkumware (in disagreement with the C++ standard) invokes the hash function of the element being erased, which would negatively affect its performance for elements harder to hash than simple unsigned ints. 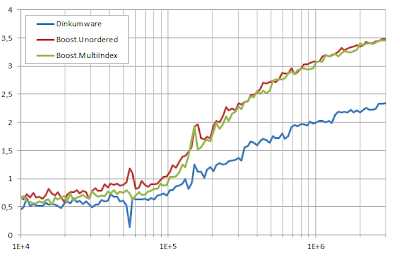 That said, the special provisions Boost.Unordered and Boost.MultiIndex implement to accelerate the processing of groups of equivalent elements have not yet achieved spectacular performance improvements, or even result in decidedly slower times. It is at lookup that these libraries excel, as we will see in a future entry. The random source produces duplicate elements where each different value is repeated G = 5 times on average within a run of n invocations. 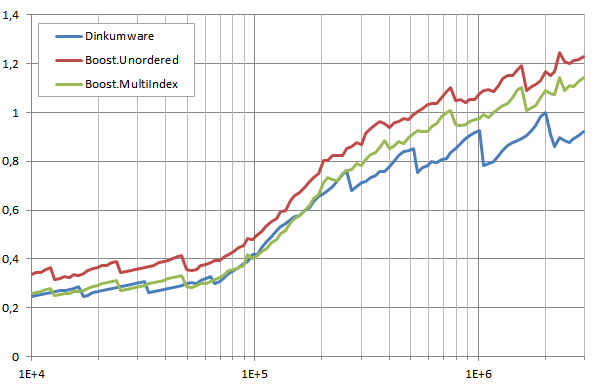 We study the performance with maximum load factors Fmax = 1 (the default specified by the standard) and Fmax = G = 5. The latter case results in an element distribution across buckets equivalent to that of a container without duplicate elements being fed the same random source (i.e. where each group of equivalent elements is reduced to just one element). 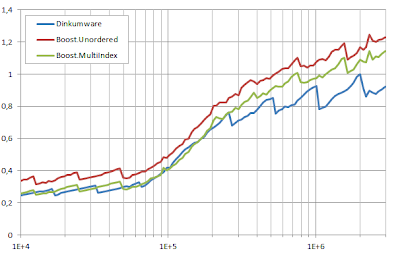 As studied before, this favors implementations that are able to skip groups of equivalent elements in constant time, which is the case for Boost.Unordered and Boost.MultiIndex. The test program was compiled and run on the same environment as in our previous entry. 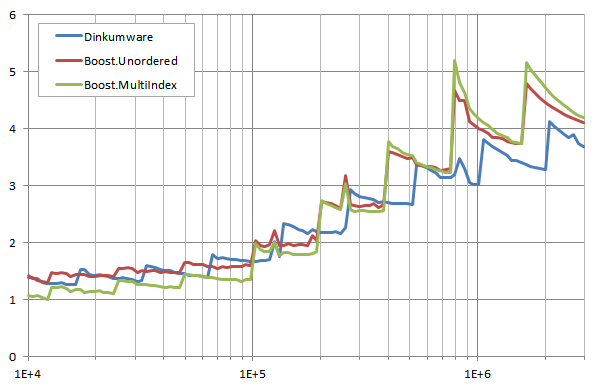 The first figure shows the results for the non-rehashing scenario and Fmax = 1, times in microseconds/element. 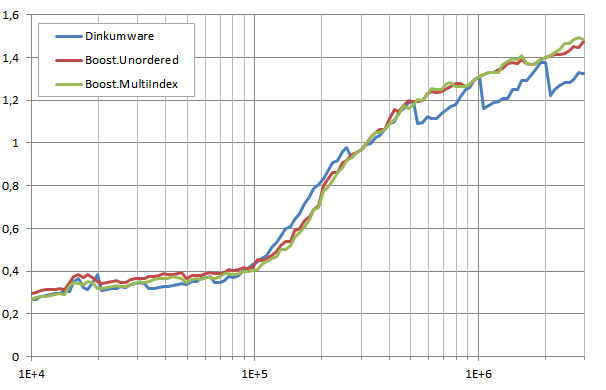 The sigmoid shapes due to CPU memory cache effects should be familiar by now. Boost.Unordered and Boost.MultiIndex perform very similarly despite their different data structures and insertion algorithms: the former is slower at determining the end of a bucket whereas the latter does worse for groups of size < 3, and these two effects seem to cancel each other out. 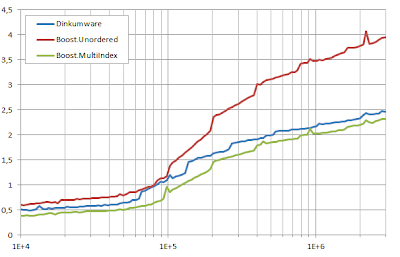 Why is Dinkumware as fast or even faster than the other two libraries? As we have proved in another entry, the distribution of elements when duplicates are allowed varies significantly with respect to the non-duplicate situation for the same load factor: here many more buckets are empty and the probability that two groups of elements end up in the same bucket is much lower: consequently, most of the time the insertion procedure needs not traverse the entire bucket and the fact that Dinkumware cannot skip groups in constant time is irrelevant. 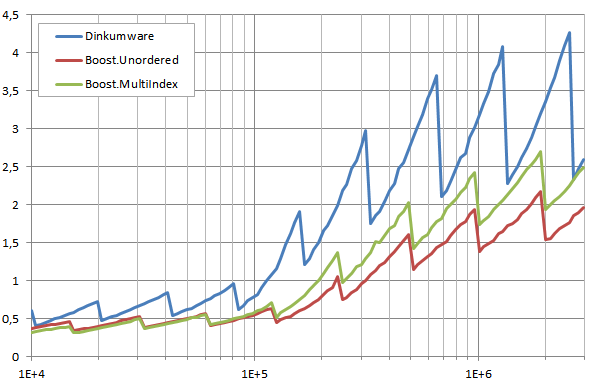 Furthermore, the locality of Dikumware is better than that of Boost.Unordered and Boost.MultiIndex, which need to access the first and the last element of a group upon each new insertion; this shows up as an additional advantage for Dinkumware when n is large and most of the memory active set lies outside the CPU cache. 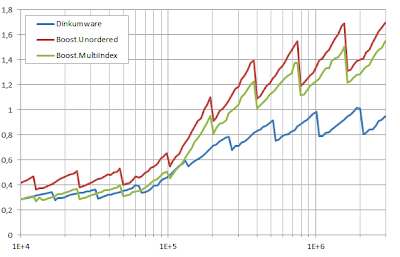 Although the level of bucket occupancy is five times higher, Boost.Unordered and Boost.MultiIndex insertion times does not grow much, precisely because they are not affected by the size of groups of equivalent elements. On the other hand, Dinkumware performance, as expected, degrades noticeably: when two groups occupy the same bucket, which is now more likely, reaching for the second group implies traversing all the elements of the first. 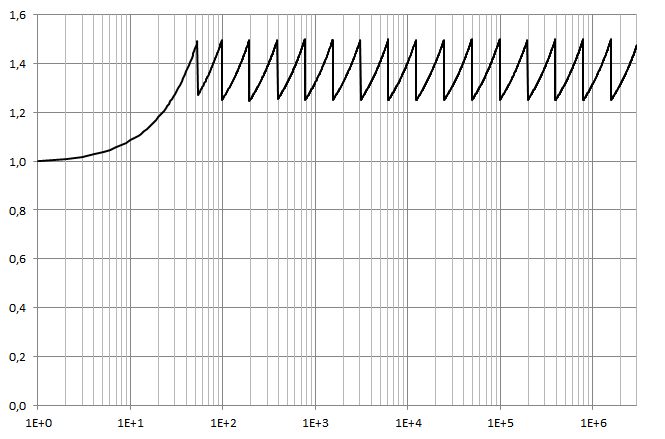 The following figures show the the inserton times for the rehashing scenario and Fmax = 1 and 5, respectively. 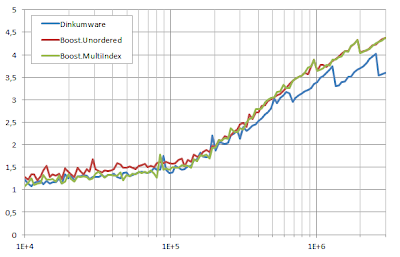 Dinkumware rehashing procedure is the slowest from an algorithmical point of view (each element is rehashed separately) but has the best locality, which compensates its initial disadvantage when n grows. 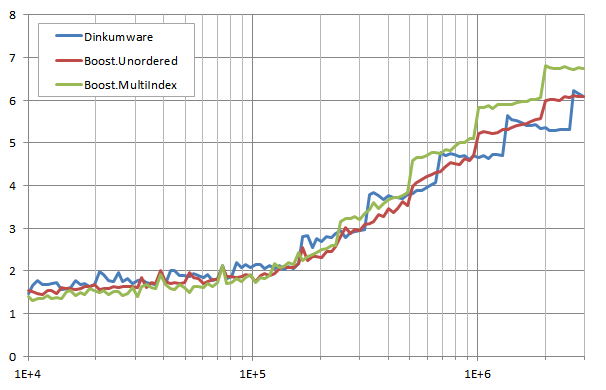 Boost.Unordered rehashes fastest of all three libraries because the implementation stores precomputed hash values within element nodes. This is more apparent for large values of n, as evidenced by the height of the graph "steps", and would show even more distinctly if the elements were harder to hash than the plain unsigned ints we have used (for instance, if we had dealt with std::strings). In future entries we will go on to profiling erasure and lookup times. Equipped with our theoretical analysis on the complexity of insertion for C++ unordered associative containers without duplicate elements, let us now measure the real thing. I have written a program that profiles running insertion times for Dinkumware, Boost.Unordered and Boost.MultiIndex. Tests were compiled with Microsoft Visual Studio 2012, default release mode settings, and run on a Windows machine with an Intel Core i5-2520M processor running at 2.50GHz. The results for n = 10,000 to 3 million elements are depicted in the figure. Times are microseconds/element. 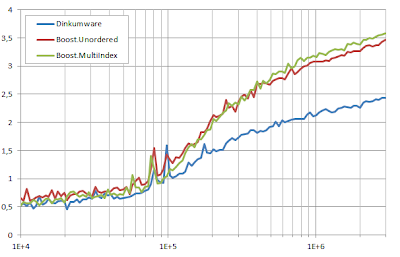 Boost.MultiIndex does slightly faster than Boost.Unordered because determining the end of a bucket only involves some pointer checks in the former lib whereas the latter has to use more expensive verifications based on stored hash values. Dinkumware bucket arrays sizes are powers of two whereas Boost.Unordered and Boost.MultiIndex resort to an (approximately) geometric progression of prime numbers: the former scenario allows for a much faster mapping of hash values to bucket entries because n%m, which is in general an expensive operation, can be efficiently implemented as n&(m-1) when m is a power of two. 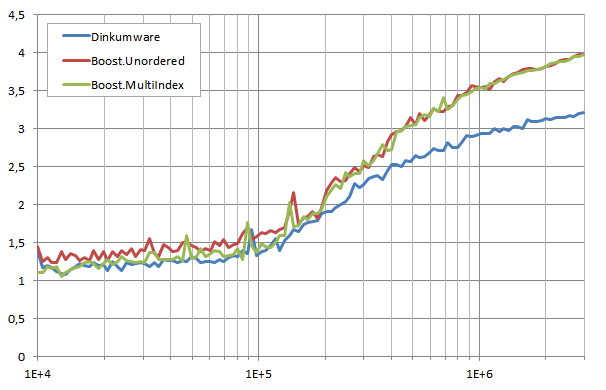 On the other hand, Dinkumware's pointer manipulation is the heaviest of all three libs, and the net result is that its observed insertion performance sits more or less between those of the other two. Dinkumware excels when n is large because of the advantage we mentioned about using powers of two for bucket array sizes, more prevalent under rehashing conditions. 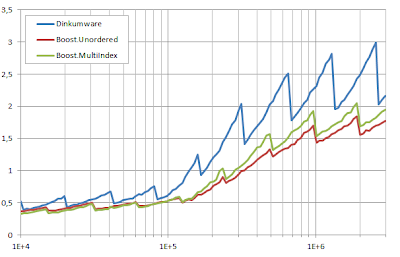 Unlike Boost.Unordered, Boost.MultiIndex needs to calculate and temporarily store hash values each time a rehashing occurs, which eats up its head start when n grows. Note that the test uses unsigned ints as elements, whose associated hash function is trivial: if the elements were harder to hash (like in the case of std::strings), Boost.Unordered, which is the only lib that stores hash values, should beat the other two for large numbers of elements. C++ unordered associative containers make the beautiful promise of (average) constant time insertion provided hashing is done properly. 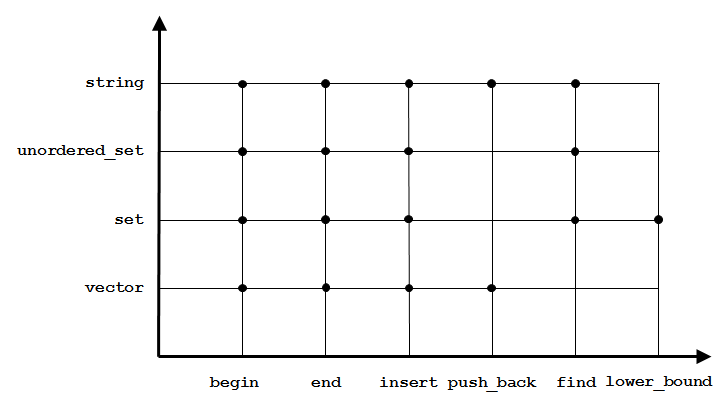 Let's see the algorithmic theory hash table insertion relies on. We restrict ourselves to discussing containers not allowing duplicate elements (unordered_set and unordered_map, which, for the purpose of this analysis, are entirely equivalent). f(n) = Σi=1,..,n t(i) = an + bn(n-1)/2B0. r(m,B) := a'm + b'm(m-1)/2B. 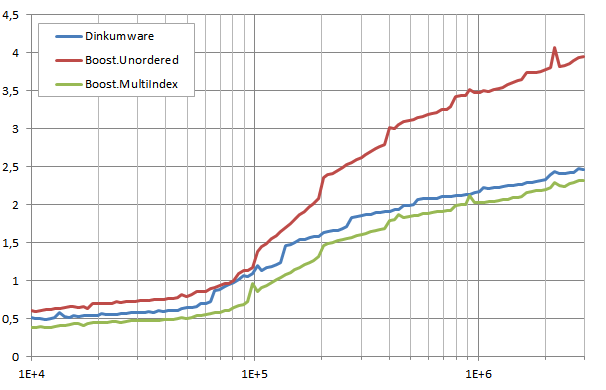 53, 97, 193,... is the sequence of bucket array sizes used by Boost.Unordered and other implementations of unordered associative containers. 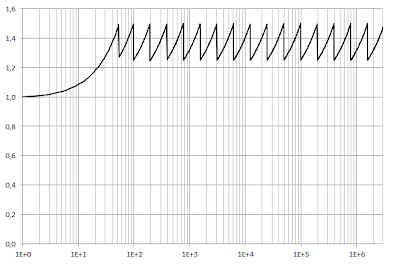 The graphic shows f(n)/n with Fmax = a = b = a' = b' = 1 for n = 1 to 3·106; the horizontal scale is logarithmic. Proposition. f(n)/n is bounded if bucket array sizes follow a geometric progression. The (approximate) bounding formula yields 4.25 for the function depicted above (K ≃ 2), in excellent agreement with the graph. where B is the minimum bucket size such that n ≤ FmaxB. f(n)/n is, again, bounded, as shown in the figure. We omit the proof, which is much simpler than the previous one. In this case, the bound on f(n)/n is a + bFmax/2. Note that this does not depend on K precisely because there is no rehashing involved. So, the promise holds true: if the container uses bucket array sizes following a geometric progression and hashing behaves well, insertion is O(1) on average (either with or without rehashing). In a later entry we will see whether real implementations of unordered associative containers live up to theory. In a prior entry we reviewed the data structures used by some popular implementations of C++ unordered associative containers without duplicate elements (unordered_set and unordered_map) and described a new approach introduced by Boost.MultiIndex hashed indices. Let's continue with the corresponding containers allowing for duplicate elements, unordered_multiset and unordered_multimap. Algorithm complexity is not bound by the load factor but instead depends on the average length of groups of equivalent elements. 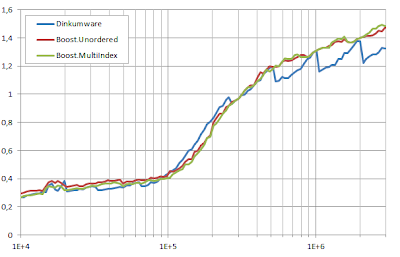 Implementations of unordered_multiset/unordered_multimap can do nothing to alleviate the difficulties with load factor management: the standard codifies its behavior very precisely with little room for reinterpretation or improvement. An observant user can remedy the situation on her own by setting FG as the load factor, where F controls the level of occupancy (i.e. it is the equivalent load factor for the case where no duplicate elements are allowed) and G is the average length of element groups. As for the second problem, an implementation may choose to enrich the internal data structure so that element groups can be skipped in constant time (the standard specifies that equivalent elements must be packed together): in this case, group length is no longer an issue and the container provides the same performance guarantees as the non-duplicate version. What do popular implementations do in this respect? None of these libraries makes any special provision to handle groups of equivalent elements in an efficient manner: they rely on the same data structure used for non-duplicate versions of the containers. The figure shows a group of five equivalent elements located at bucket b2. An additional back pointer is added to the original structure that reverse-links the elements of the group together in the way a circular doubly linked list does. This back pointer allows groups to be treated as whole units: when traversing a bucket for insertion or erasure, only the first element of each group need be inspected, and the rest can be skipped by following the back pointer to the last element. 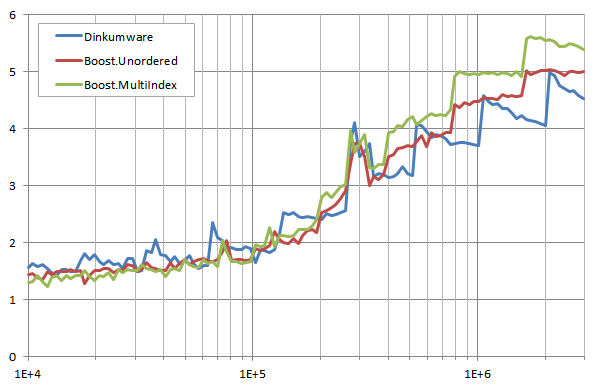 The penalty for this performance improvement is one extra pointer per node. the element preceding X is Xpn if X is the first of its bucket, Xppn if X is the second of a group (of length ≥3), Xp otherwise. Use the hash function to locate the corresponding bucket entry → constant time. Traverse the first elements of each group in the bucket looking for a group of equivalent elements → time linear on the number of groups in the bucket. If a group was found, link into it; otherwise, link at the beginning of the bucket → constant time. Adjust bucket entry pointers as needed → constant time. Unlink from the (doubly linked) list → constant time. Adjust bucket entry pointers if the element is the first or the last element of its bucket, or both → constant time. The actual implementation is more complicated than this overall description suggests, since linking and unlinking must maintain the special redirections used to identify groups, but the net result from the point of view of performance is: insertion and erasure times depend on the number of groups rather than the total number of elements and have the same complexity as the non-duplicate case, i.e. O(1) for insertion if the hash function works properly, unconditionally O(1) for erasure.